The original stories about the sacredness of all life can be found on walls of caves and temples and the first writings. The ancients understood their connection with animals to be a spiritual principle. This original knowledge still exists in the texts of world religions and philosophies. Yet, virtually no Western religion today teaches its followers how to practice compassion toward all species and how to protect the natural world. What happened? 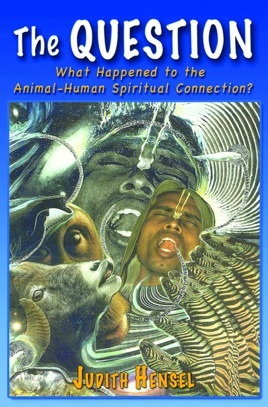 Could misinterpretation of the religions’ texts and an incomplete understanding of the meaning of spirituality be why the human species continues to cause pain and anxiety upon the other animal world -- as shown by unnecessary animal experimentation, inhumane slaughtering methods, using animals in “sport” and entertainment, and the wanton destruction of animals who live in the wild? What happened? When and why did the other animals become invisible in our spiritual adventure? Why did we place ourselves over and above all other animals in some sort of hierarchical system? Did the separation come about simply because of human material wants and needs? Or, are there reasons that we have yet to imagine -- beyond religion, science, and history? What happened? Whether we are interested in the other animals or not, we share our lives with them. They are everywhere -- flying overhead, meowing a greeting, buzzing at our window, swimming in our lakes and in the glass bowl on the kitchen counter. Animals share the earth we walk on, the air we breathe, and the food we consume. They are the food we consume. Whether we notice them or not, they are there. Always there. They live among and with us. The intention of The Question is to inspire a shift in beliefs and attitudes toward all animals that is unswervingly compassionate. The book might be interpreted as a challenge to established religions, especially among their conservative adherents. It is not an evangelistic treatise “pro” one point of view and “con” another. Far from it. This is why the action takes place somewhere across time and space in an imaginary realm, Sanctuary, where every point of view is accepted as an aspect of the same truth. The other animals accompany representatives of people as they are taken to their self-secret innermost core and out to the edge of their imaginations where they are able to discover the answer to the question -- as well as find their own true selves. The readers are asked to check their beliefs about the other animals at the door, and sit back and participate in the action as if they were seated at a play. From their seats, the reading audience will witness Universal Images -- people from out of past history and living today -- enacting their innermost beliefs as they seek the answer to the animals’ question. Maybe some in the reading audience will leave the theater with their minds changed. Perhaps be inspired to tell others what happened there. That would be the greater intention. What are the book premises? “Religion” and “Spirituality” are not interchangeable concepts. Spirituality is the actualization of one’s innermost, self-secret beliefs as shown by his and her attitudes and behavior toward people, and also the other animals. In this context, all interaction with others is spiritual action. There is a disturbing vacuum in Humanity’s spiritual beliefs that denies the other animals a place in our lives. The void appears to be impenetrable. Animals are rarely included in our laws, sciences, histories, religions -- other than using them as sacrifice or healing tools. It is time for a universal shift in human consciousness, which reconnects humankind’s partnership with the other animals -- not only for the Earth's sake, but also for the evolution of the human soul.